Ok, so you want a mount for your Garmin GPS, and you're the awesome kind of person who'd rather spend $5 and 30 minutes building it (30 minutes is to get the parts, not actually build this, which takes about 5 minutes tops), rather than spending $30 plus shipping on a pre-made one. This tutorial is for you. 2x 5/8" washers -- get more than 2, get 12-20, because not all washers are built to NASA tolerances, and some won't fit. I'll omit actual assembly instructions as a test of your evolution. If you have ever played with Lego, or can count beyond 3, you should be able to pass this test. I hope you all pass. You'll notice I didn't screw on my bead completely. This is because I don't want to. You can if you wish. Slide the assembled unit down the steering tube, and make sure it doesn't drop into the tube, or you may never get it back. You're going to want to keep the bead off the bolt for this because you'll need to hold the bolt while you tighten the top coupler nut with a wrench. This will make the hose expand inside the tube and keep your mount super secure. Be sure to tighten the nut and squeeze that hose a LOT. The more friction, the stabler, and the merrier. Once it's secure to your satisfaction, screw on the bead (with or without loctite/glue, I opted for no loctite/glue in case I need to later switch beads in the future for any reason. I figured I can always glue it later if necessary). 1) The beads from Craft store came with a bore hole that's made for fishing line thickness necklace wire, or whatever it is they use. 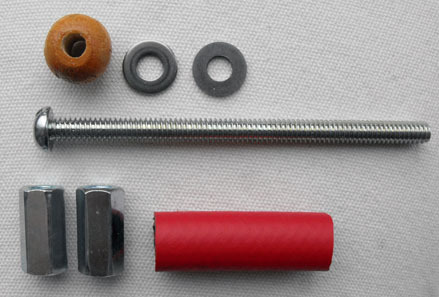 This is far too small for the bolt, so you'll need to bore a hole into the wooden bead. I recommend a 7/32" bore, which will be "one size" smaller than the bolt itself, ensuring maximum friction. Screwing on the bead may feel laborious and difficult, but you'll be safe in knowing the friction will keep your stuff securely in place in every dimension. 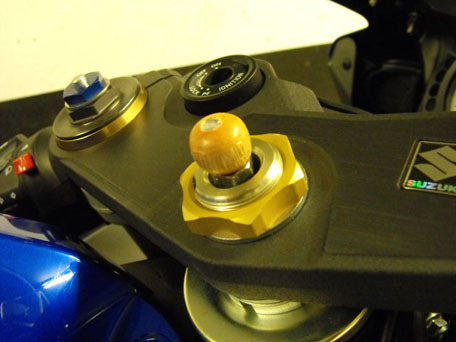 DO NOT bore a hole too large or the bead will simply slide freely along the bolt, which is counterproductive entirely. 2) Putting the cradle on the unit may require a bit of force that will unnerve you. This is ok. If you find it's too easy or too hard, it means you've used the wrong size bead. That's why you have 11-19 more. It should snugly "snap" into the Garmin cradle. I would advise against popping it on and off repeatedly, as it is made of wood and you will over time degrade its ability to hang onto the cradle. I normally leave my cradle on my bike anyway, with a small plastic bag over it so rain doesn't damage the connectors. Up to you what you do here. 3) Put an additional safety cable directly from my GPS to the bike's frame, "just in case" this stuff all fails. So far, it hasn't even come close to, but safety first. 4) Enjoy this Effing Awesome project! Last edited by jeffjones; 05-09-2012 at 06:57 AM. I ordered a mount from China that I am waiting to come in for $2 and cutting the ball off that and using it instead. The more you take the GPS clip on and off the ball starts to lose the tight grip. I will post pics when it comes in. That's pretty hip! Very, clever. Very clever, but I would rather just buy a RAM mount. They look much better. Hey Jeff , nice job mate ! looks neat ! I agree the wood ball looks a little cheap but once I get my black garmin ball from china it will look alot better, You won't be able to notice it as much. In that case, it will be just as good as the RAM one. Post pics when you get it done! I too would rather build something than buy it, but if I can't make it look good then I won't. For example, the wiring I made for my new reg/rect looks better than OEM to me. good shade-tree solution, especially if you can't/don't want to go all the way through the neck, and the basic mechanical concept here is quite adaptable. for an alternative, here's my old write-up using 2 pieces of pvc and a nut. I did a somewhat similar take , see what you think.